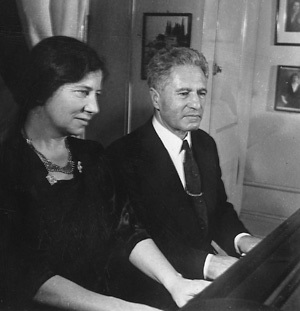 The Karl Weigl Foundation, founded in 1999, is dedicated to preserving the legacies of the Austrian-American exile composers Karl Weigl and Vally Weigl, and to encouraging rediscovery and appreciation of music suppressed by the Nazis. private musicales, performing four-hand piano works. Karl Weigl (1881–1949) — important contributor to the ferment of musical styles in Vienna in the early twentieth century. Vally Weigl (1894–1982) — pianist, teacher, composer, political activist, and pioneer of music therapy. Along with other Jewish émigrés they contributed to the transformation and enrichment of American culture.